BAKERSFIELD, CA. — Last Wednesday, the state approved a list of cannabis regulations including annual license applications and cannabis industry definitions. 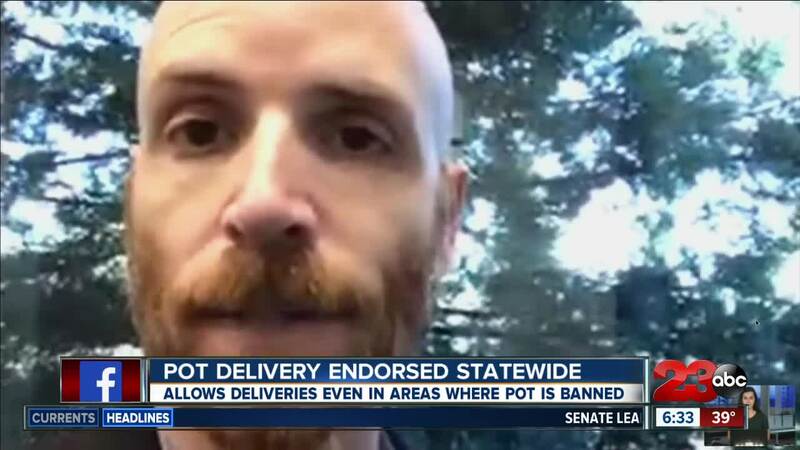 The state also made an extra effort to endorse a rule that will allow cannabis deliveries even into cities like Bakersfield that ban commercial pot sales. “When Prop 64 passed there was a section in the law that said cities cannot prohibit licensed distributors from using the roads," said Bakersfield City Attorney, Richard Iger. "So we kind of always saw that the state was going to give access to everyone since this was a voter initiative." According to the Bureau of Cannabis Control's Chief of Communication, Alex Traverso, the law has been in place for months due to a proposition by Governor Brown. "When we were pursing our regulations we wanted to clarify that that was in the statue it was already in the law and when we did that that sort of creating a storm from cities and counties saying 'hey how is this legal if we have a ban that should ban all cannabis activities including deliveries and that's not the case it's in the law currently” ," said Alex Traverso. The city attorney for Bakersfield says they will continue to ban store fronts and commercial cannabis activities. “Growing, testing, manufacturing.. None of those will exist… most of the nuisance problems that you see for marijuana still cannot exist in bakersfield its just people can get it to their homes just like any other prescription or package," said Iger. The city attorney says he recognizes there is a portion of the community whose needs are being unmet. “We do recognize that there are patients that need medical marijuana and since we dont have the storefronts this is a way for those people to get legal access to medication," said Iger. However, the BCC says it won't be as easy as it seems to delivery pot across the state. “You have to get a license from the state, a license in a particular jurisdiction issuing license… after that it's just based on bandwidth how far you’re willing to deliver or if you want to stay in your own area," said Traverso. Although pot delivery is still unfamiliar territory, the city will continue to monitor how the community reacts especially law enforcement.